Are you tired of being yourself? Would you like to be able to hit the reset button, and redesign key areas of your life – starting today? We all need a change sometimes – new clothes, new friends, a new job, a new diet. But sometimes these superficial changes simply aren’t enough. Occasionally you need to change a core part of yourself that just hasn’t been serving you properly. You need to start again from scratch, to reinvent your life, replacing old unhelpful habits with new constructive ones. And you can do all of that in just a matter of hours – with help from hypnosis. Become a Brand New You! 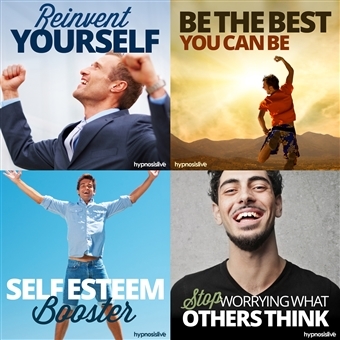 The four inspirational sessions in the A New You with Hypnosis Bundle will help you discover your own sense of worth and value, adjust your personality, ignore the negative influence of others, and become the person you’ve always wanted to be. Become a new you, banishing bad habits and low self-esteem forever. Infuse your mind with powerful new attributes that serve you well. Change your thinking to become more confident, friendlier, tell more jokes, be more attractive – anything you desire. Just decide how you’d like to change, and let this session make it happen. Reinvent yourself with positive new traits and habits! Dig deep into your subconscious, find the outdated self-beliefs, and hit the reset button. Discover who you want to be, and then work to build that perfect persona. Instantly overcome the anxiety and fear that you’re not good enough, banishing negativity and bringing positive energy to every situation. Be the best version of yourself, 24/7, 365. Reprogram your mind to see yourself as valuable and worthwhile, with a high self-esteem. Train your brain to help remove negative self-beliefs – reaffirming the positive aspects of your personality. Install new reflexes that respond to anxiety rapidly, and never again feel overwhelmed by the world around you. Boost your self-esteem and love the amazing person you are! Learn to stop worrying about outside influences and be proud of who you are. In this session, you’ll dissolve the fear that others are judging you, replacing negativity with positive energy. You’ll create new habits that kick in instantly when you start to feel unsure of yourself, rediscovering your self-esteem and refocusing your energies. Stop obsessing about what other people think! Download the A New You with Hypnosis bundle now to live a brand new life free from limitations and full of possibilities. Totally Reinvent Yourself, using Hypnosis!